2 power in/out connections, 4 switch connections and 4 light connections. 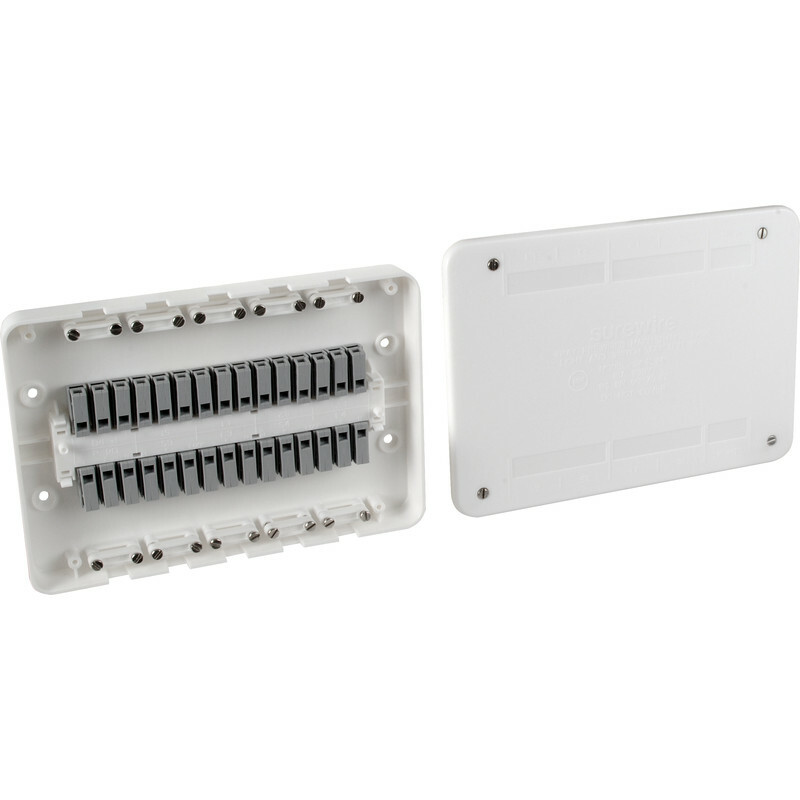 Surewire 4 Way Pre-wired Light & Switch Junction Box SW4L-MF is rated 4.6 out of 5 by 7. Rated 4 out of 5 by sidders82 from Very convenient way to split a circuit Splitting a circuit into 4 for spotlights can be tricky with a normal albeit cheap junction box so tried this and it worked well although the individual clip junctions are fiddly to hold down as you try to work the cable in so took a bit of time to make sure all the cables were properly secured in. It's a payment for convenience but definitely recommend. Rated 5 out of 5 by Er64 from THE alternative for me... A new build and I didn't want to use the traditional junction boxes. I found this solution what is covering my idea of tidy work, it is easy to install and I could install it in one place. Rated 3 out of 5 by old engineer from Alternative junction box It is a very expensive alternative to traditional junction boxes, although it is very easy to use. The connectors don't seem very well anchored in the unit, and move about when trying to insert wires. There are strain reliefs on each entry which seems a bit superfluous for permanent wiring. Also these use screws! Not an option I would consider in the future. Rated 5 out of 5 by mattfran from Pricier than regular JB's, but so much easier! Certainly more expensive than just using Junction Boxes, but these are so quick and easy to connect up and (particularly if exposed) look a lot neater. Rated 5 out of 5 by The Accountant from Makes life much easier Used one of these to connect up 4 lights / switches. Made for a far tidier loft - no need to loads of junction boxes and tangled wires. Push fit connectors are a bonus in many ways, though they do feel a bit flimsy. Overall it was good enough for me to buy another! Rated 5 out of 5 by Taken6years from Useful junction box This is mainly suited to new installations ? rewires as all lamp fittings and switches are connected to this box (e.g. for one room or landing). Easy to use & strip cables for it. The only "trick" is pressing all 3 L-N-E junction together so the three cores go in at the same time (perhaps my thumbs aren't wide enough!). Maintenance free so you should not need to revisit it but any changes are easy, just press and pull. Overall, it allows a tidy job. Rated 5 out of 5 by PeterCH from How to replace a junction box without swearing Had to replace an old junction box with the earths outside the box. Made the process dead easy.